You find yourself standing before a gate to a secret walled garden. It is spring, and the air is scented with the perfume of flowers and rich warm earth. You hear laughter coming from the garden, so you open the gate and step inside. The garden is lush with flowers, roses and honeysuckle climb the walls, and lavender, rosemary, and hyacinth all combine into an intoxicating scent that nearly makes you swoon with its beauty. You see six sisters holding hands in a circle, dancing, singing, and laughing around the seventh sister, Maia, standing in the center of the circle. Look at each of the circling sisters. Which one resembles you? Move closer to the sister that you have chosen. Move into the sister that you have chosen. Become the sister that you have chosen. Dance and laugh, sing with your sisters as you circle Maia. You are carefree, enjoying the gentle warmth of the sun, the companionship of your sisters and the security of your garden. Maia is the center, she holds you all together, she is the hub of the wheel, and you and your sisters are the spokes. Suddenly, a cloud envelopes the sun, and a chill wind raises goose-bumps on your bare arms. You and your sisters stop singing and circling, a feeling of foreboding permeates the air around you. The sun is gone, the blanket of night has descended. As one, you look up into the night sky, and there in the sky is Orion with His mighty sword ready to strike you and your sisters. In an instant you are all transformed into doves and you leap into the air, flying high into the starry sky. You leave Orion and His sword far behind you, as you cluster together with your sisters, a unified sailing flock of doves, forever shining, forever together. Maia is the hub, and you and your sisters are the spokes. 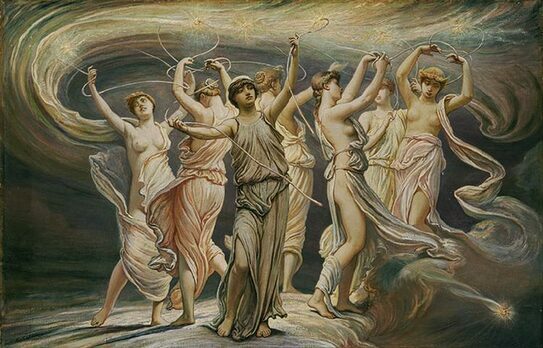 Your light shall guide sailors and seekers throughout time, as you and your sisters dance to the rhythm of the Universe, forever together. The light from within you merges with the light of your sisters, many lights become one light, forever together. Take a few moments, sailing on the tides of space. Be aware of all you see, feel and think. You will remember all that you see, feel and think. It is now time for you to return. Feel yourself becoming more rooted to the Earth, as your consciousness begins to shift back to reality. Become aware of your body, wiggle your fingers and toes. Take a few deep breaths and when you’re ready open your eyes.